Here is a press release from Westar about our Jesus Seminar on the Road with Brandon Scott and Art Dewey. Register today. It takes all of two minutes. Go on ahead. You will love it. Lost for ages in the backwaters of allegory and simplistic preaching, the parables of Jesus have emerged in modern scholarship as the creation of a great artist. In a program entitled “The Parables of Jesus,” scholars of the Jesus Seminar will ask what parables are and how Jesus used them to destabilize his listeners’ world. 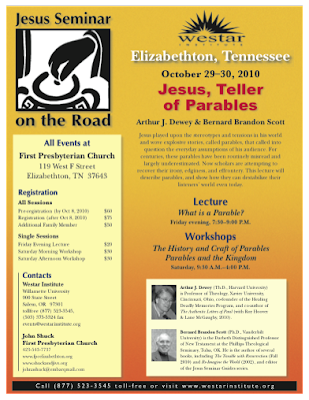 The program, which is part of the “Jesus Seminar on the Road” series sponsored by the Westar Institute, a non-profit organization dedicated to religious literacy, will be held at First Presbyterian Church, 119 West F Street in Elizabethton, TN on Friday & Saturday, October 29-30, 2011.
will discuss how Jesus played upon the stereotypes and tensions in his world and wove explosive stories, called parables, that called into question the everyday assumptions of his audience. On Saturday morning, in a workshop entitled “The History and Craft of Parables,” Dewey and Scott will give an overview of the art of story-telling and the several methods involved in the interpretation of stories, ancient and modern. Participants will examine the ancient craft of parable-making side-by-side with modern examples of transparent poetry and creative songwriting. This workshop will explore not only what a parable might mean, but also how it means to be taken. Jesus' parables are both a door and a mirror to the kingdom of God. In a workshop entitled “Parables and the Kingdom,” the presenters will ask: does the kingdom illuminate the parables (Matthew) or do parables illuminate the kingdom (Mark)? Better yet, do we unravel the parables, or do they unravel us? The parables of the Banquet and Unjust Steward, the Prodigal Son, the Good Samaritan, the Leaven, and the Mustard Seed will serve as the primary texts for this presentation. All events open to the general public. Registration is $75 for all three events, and $50 for additional family members. The individual cost is $20 for Friday evening and $30 each for Saturday morning and afternoon sessions. Registrations can be made through Westar Institute, Willamette University, 900 State Street, Salem, OR 97301, by calling (503) 375-5323 or toll free (877) 523-3545, or online at www.westarinstitute.org. Questions on local arrangements should be directed to John Shuck at First Presbyterian Church, 423-543-7737. Arthur Dewey and Bernard Brandon Scott are available for interviews. For more information contact Bill Lehto (651) 605-5275. For background visit Westar Seminars. John: shock of shocks, I agree with at least some of what is said about the parables here. As I read the parables and preach and teach about them I find that many if not all of them shock the hearers forcing them, if they are willing to hear that Jesus brings a different way of looking at the world. Many of them start off the way current parables (and jokes about the rich and the powerful) were told in Jewish culture of the time and then move off what the hearers expect into unexpected territory. The parables of the lost sheep, lost coin, good Samaritan and prodigal son (although I don't think that is the best name for it) are all examples of this. And yes: re your later post there were differing views of the resurrection in early Christianity just as there were differing views of who Jesus was, particularly in relation to God. Why would that surprise us? After all that was part of what the fights in early Christianity were all about. Whether we can find them in the Bible is a very interesting question. Example: what is a spiritual body? Do we follow Greek categories on this or Jewish categories or something else entirely? I think one of the biggest problems in studying and understanding early Christian writings is to try and figure out the paradigm of the writer. 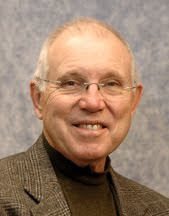 And just to make things more complicated some scholars (like Dr. Deconnick) argue that there was no such thing as Judaism in Jesus' day, that Judaism was formed after the destruction of Jerusalem!